Belgium, home to arguably the best waffles, arguably the best beer, and certainly, the best deathgrind band in the world, Aborted. It seems that the Lords of Gore decided to turn the crazy dial to maximum insanity on the 12 track, 43-minute carnivorous abomination that is their newest record, Retrogore. 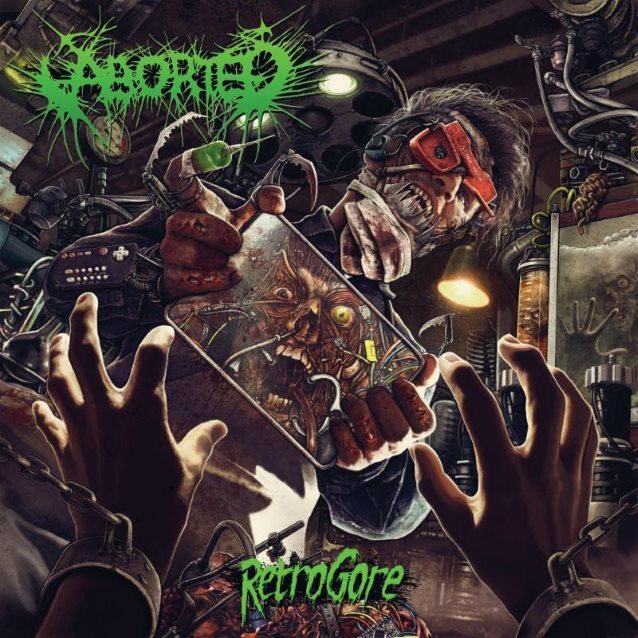 Aborted is no newbie to death metal, infusing their own breed of madness into the genre, drawing influences from grindcore and technical death metal. It was impossible to not take note of Global Flatline, where the Belgian butchers decided to shed their grindcore skin and move towards a more traditional death metal sound. Following that, 2015’s Necrotic Manifesto was a brilliant album, and with Retrogore, they were determined to push the very boundaries of what you can do in the death metal genre. Starting off with the opener Dellamorte Dellamorte, the seemingly innocuous yet eerie gramophone sample reminding you that you are inside a horror movie, the listener is instantly plunged into a world of pain with the opening riff of the title track Retrogore. Suffering line-up changes with every album over the last few years, most bands would crumble under the pressure of writing a good record, but that wasn’t enough to stop Aborted from swinging their blade with new axeman Ian Jekelis (God Dethroned, ex-Abysmal Dawn). Along with fellow guitarist Mendel bij de Leij and bassist JB van der Wal, the musicianship on this record is probably the best that this band has seen since its inception. Guitar riffs vary from razorwire ferocity more akin to technical death metal, to gut-punching mid-paced sections, which when accompanied by heavy bass gives a truly cohesive machine of torture. Ken Bedene decided to take off his straightjacket with this record to release all of his unrestrained blast beats and double bass carnage that make this album a vicious beast. Vocalist Sven de Caluwe is quickly making his mark as among the best death metal vocalists of all time with his performance on Retrogore. Bonus points to Christopher Lovell for that “gore”geous album artwork and Kristian Kohlmannslehner for his tight production. Trademark samples (courtesy of Alex Karlinsky) from various horror movies, documentaries, and interviews with infamous serial killers are ever-present in Retrogore, as is to be expected from any Aborted record. Tasteful orchestral samples truly infuse a sense of grandiose terror in the listener and set tracks like Bit by Bit apart. Notably, a numerous set of guest vocal appearances adorn this tapestry, in the form of David Davidson (Revocation), Julien Truchan (Benighted), and Jason Keyser (Origin). Special mention must be made of the track Divine Impediment, the “slow ballad” of Retrogore, featuring Travis Ryan (Cattle Decapitation) and his agony-filled shrieks making this one of the best tracks on the record. This album is sheer auditory torture, and that is sadly one of its failures as well, it is almost too unrelenting in its assault. There is no respite, no surrender, and no salvation in Retrogore, which can make it an almost exhausting listen. This album is a classic example of the adage “too much of a good thing is bad”. I wish Aborted lifted their feet of our throats even if just for a filler-track midway through the record. But if that is the only complaint, surely Retrogore will feature on many Album of the Year lists, and not without reason. Do not let the title of the album fool you, there is nothing nostalgic or bittersweet about the pummeling that you are in for if you decide to sit through the entire album, and by the God of Blood and Meat, you absolutely should! Favorite tracks: Bit by Bit, Divine Impediment, Termination Redux.